I love birthdays! Even though my birthday is at the beginning of October, I always feel like I should get to celebrate all month long. But it isn’t just people birthdays I love — I also get super excited about book birthdays! And today is the birthday of a book I am thrilled to share with you, written by a woman I deeply admire and respect and am thankful to call friend. 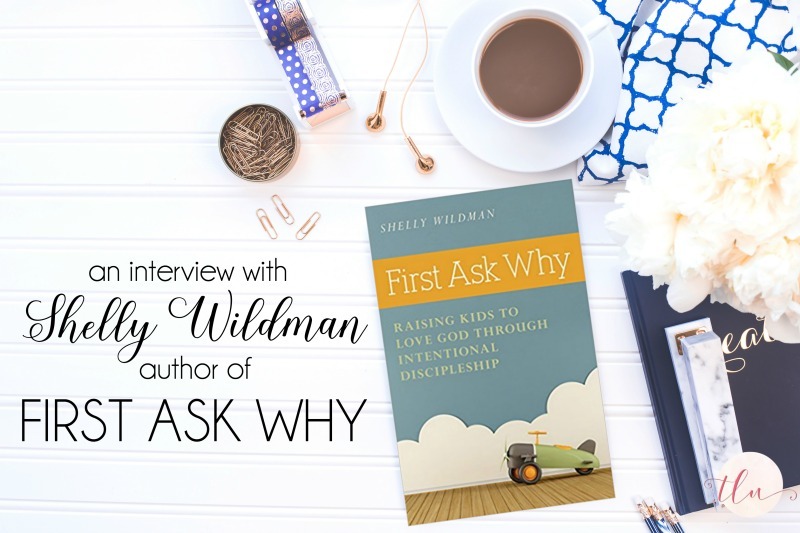 First Ask Why: Raising Kids to Love God through Intentional Discipleship by Shelly Wildman needs to be on every parent’s bookshelf. Actually, skip the bookshelf and just keep it on the table by your chair because it is so rich and full of wisdom and grace. Shelly and I have known each other via the internet for several years as we both were writers for Mothers of Daughters. Over the past year or so, our friendship has deepened and we’ve had several long conversations on the phone and via Voxer. She is a generous friend, quick to share what she’s learned and to encourage. I’m beyond grateful for her presence in my life. Today, on her book’s launch day, Shelly has graciously agreed to answer a few questions about the book for us. I know after you read what she says you are going to understand why she is so precious to me and you are going to know you need First Ask Why for yourself! Writing about parenting can be a powder keg—people have pretty strong opinions about raising kids. Why did you choose to write a parenting book? I kind of feel like I didn’t choose to write a parenting book, but that the book chose me. (Sounds like a scene from Harry Potter, doesn’t it?) I fought writing it for a long time because I knew I wasn’t a perfect parent—I had messed up so many times that I didn’t feel qualified to write this book. I still don’t. But the idea kept nagging at me for so long that I finally felt like God might have been pushing me to do it. What makes your book different from other parenting books? So many parenting books are “how-to” books. They seem to say, “Just follow these ten steps and here’s what you’ll get in the end.” But I don’t believe we can parent by formula. I think we have to look at our unique family and ask why. Why do you think some kids, even though they had Christian parents, don’t grow up to follow God? 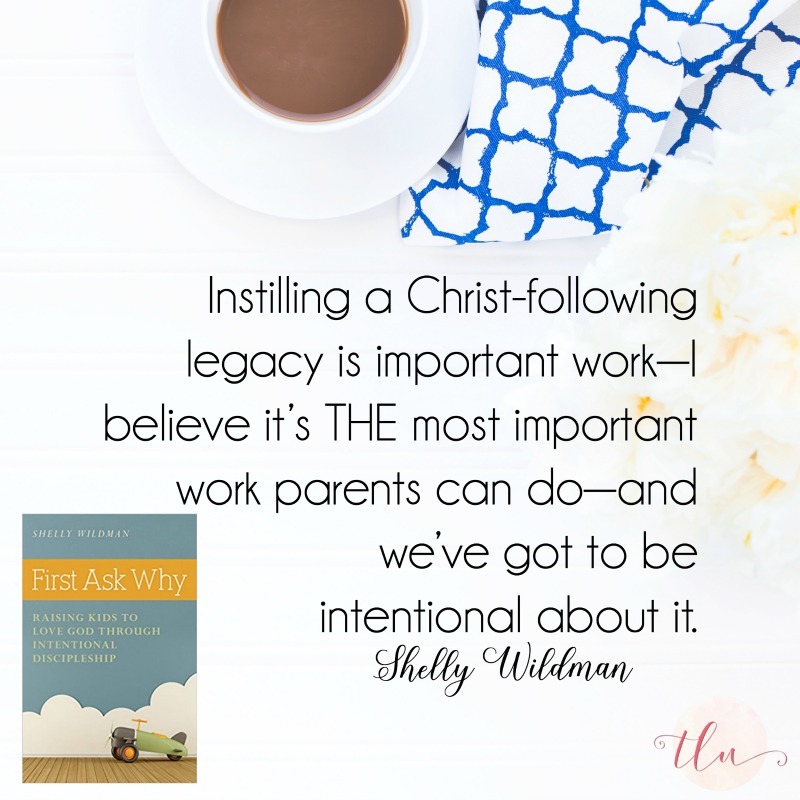 Is there anything Christian parents can do to ensure that their kids will choose to follow Jesus? This is such a difficult question for me to answer because I honestly don’t know why. I know that parents can do all the right things—have time in God’s word together every day, take their kids to church regularly, pray diligently for their kids—and still have kids who struggle. I don’t believe there are any guarantees in Scripture that our kids will choose to follow Jesus into adulthood. What books influenced your husband and you as you raised your three daughters? Honestly? Not very many. So many parenting books seemed to offer a formula—do this; don’t do that—and we weren’t looking for a formula. We knew that every kid is different and that every family has different needs, and most parenting books didn’t take that into account. That said, there were a few that made an impact. Our pastor, Kent Hughes and his wife Barbara, wrote a book called Common Sense Parenting back in the ‘90s that, well, made sense to us. Some of the information is a little outdated today, but overall, it really helped us make good decisions about our parenting. And then there was James Dobson’s The Strong-Willed Child, for the obvious reasons. I think the book that made the most impact, though, was probably Shepherding a Child’s Heart by Tedd Tripp. That book made me realize that my goal as a parent isn’t good behavior, but a changed heart. That, to me, was really impactful. If I were still parenting younger kids today, I’d also recommend Paul David Tripp’s Parenting: 14 Gospel Principles That Will Radically Change Your Family. I think my lowest moments were the times I let my daughters down. When I betrayed their trust by sharing too much with others. Or when I didn’t fulfill a promise I had made. Parents can feel their kids’ disappointment, which hurts so much. But more than that, too many disappointments lead to mistrust or a lack of respect, and I never wanted that to happen. That said, parents are human. We do mess up. We do let our kids down. And those are the times we have to humble ourselves with our kids and apologize, sincerely. We need to let our kids know that we don’t always do things perfectly or say the right things or even parent correctly. But that we need grace and the help of God as much as they do. Who do you hope will read this book and what do you hope they will gain? I hope parents with kids of all ages will read this book, but especially parents of younger children. I hope grandparents will read this book. And I hope it sparks lots of discussion between husbands and wives, moms groups, or even small groups in churches. Right? I mean, don’t you wish she lived on your street? Thank you so much, Shelly, for sharing your heart with us today! Happy book birthday, friend! I am thankful you were able to spend a few moments with us. 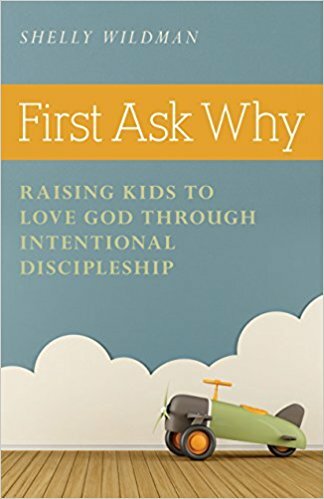 You can get FIRST ASK WHY today at Barnes & Noble, Amazon , or Kregel.com. 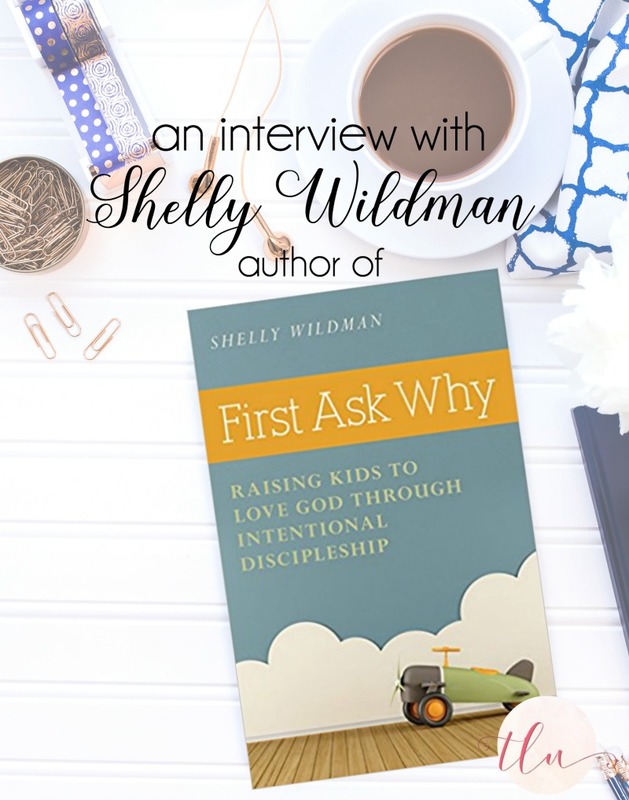 Shelly Wildman is a former writing instructor and author of the forthcoming book First Ask Why: Raising Kids to Love God Through Intentional Discipleship (Kregel). 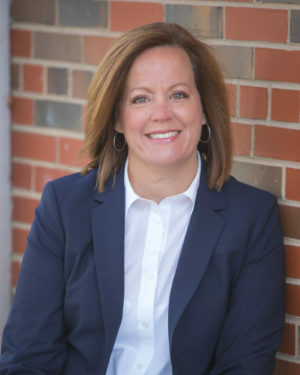 Shelly holds degrees from Wheaton College (BA) and University of Illinois at Chicago (MA), but her most important life’s work has been raising her three adult daughters. She and her husband, Brian have been married for 32 years and live in Wheaton, IL. Shelly speaks to women’s groups in the Chicago area and spends much of her free time mentoring young women. When she has time, she loves to cook, read, and travel. Thanks so much for hosting me, Teri-Lynne! I so appreciate you! And I am deeply grateful for you and your friendship! !